Emma and Natalie were wonderful tonight. A really great way to get the weekend started! The first yellow squash of the summer has been harvested with a few cucumbers. Tomatoes are still a ways off but we're happy the garden has borne its first fruit! John has had a great few weeks, from walking on the field with his MLB buddies at Citizens Bank Park to portraying Bruce Springsteen in Jersey Day to today's Fleetwood Awards, where he brought home two awards. 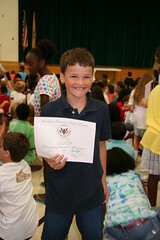 The highlight was his Presidential Academic Achievement Award, symbolic of his all-around excellent 4th grade year. Only 3 kids in his class got one. You can see from his smile just how proud he is of his achievement. What you can't see is how proudly I am smiling! I see this tool with the Blackhawks license plate and emblem hanging from his rear view. Today I had to cross a picket line to get into work. 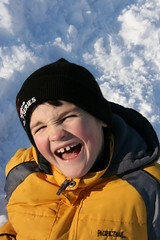 I am not sure if that was worse than hearing dismissal appeals all day, but it sure wasn't much fun!